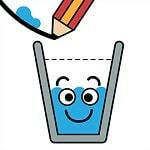 In the game Happy Glass you have to fill the existing tank with water to a certain point. At overflow or, on the contrary, with less water, the level will be failed. There are 3 game modes with unique levels, which you can hardly get through the first time.